Steven Spielberg and Tintin seemed like a natural pairing. What a relief, then, that the fruit of their teamwork is a delightful big screen adventure for young and old alike. The first sign co-producers Steven Spielberg and Peter Jackson are going to be faithful to the much beloved adventures of Tintin comes during the opening credits. Characters in silhouette play out action scenes from Tintin’s stellar career; key props from those adventures also dot the landscape; planes, trains, automobiles, rocket ships. 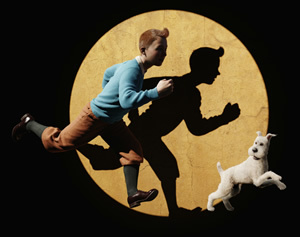 The opening credits end with the familiar sight of Tintin and his ever-faithful dog, Snowy, running side by side. Much beloved? A familiar sight? Yes. The adventures of Tintin, a globetrotting journalist, date back to 1929, pre-dating Indiana Jones by more than 50 years. Belgium was the birthplace of the modern comic strip format – and the birthplace of Tintin, fathered by Herge. Taking a cue from one of the earliest Tintin adventures, Tintin in the Congo, in which Herge inserted himself in a panel cameo, there’s a really sweet little tribute paid to the heroic journalist’s creator. The action begins in a crowded Parisian outdoor market. Tintin’s having his portrait painted; when the artist is finally done, it’s time to get the first glimpse of Tintin’s new digital face on the big screen. The reveal of the portrait features good ol’ 2D, line-drawn Tintin from Herge’s comics. The new, 3D CGI Tintin approves of the likeness and takes it. Then the artist is shown. It’s Herge himself. Nice. Given Tintin’s European heritage, it’s only fitting the movie’s already been released in Europe and lands eastward. Having amassed some $220 million in its first six weeks abroad, it’s already become the top-grossing animated film of all time in India. The story is a clever merging of two Tintin adventures, The Secret of the Unicorn and The Crab with the Golden Claws, with elements from other stories (most notably, The Castafiore Emerald) blended in for a well-rounded Tintin experience. The action revolves around a puzzle that would make Robert Langdon scratch his head. Tintin, the lucky (or, perhaps, unlucky) purchaser of an exquisite model ship named the Unicorn, finds himself embroiled in a case of international intrigue. It turns out he’s acquired one of only three such model ships in the entire world and there are some collectors extremely anxious to get their hands on Tintin’s new purchase. It’s not that they’re completists per se; they’re in need of the model ship because of it what it contains: a hidden message that’ll lead to buried treasure. Problem is it’ll take the merging of the secret message from each of the three ships to unlock the treasure’s secret location. While piecing all of the disparate elements together, Tintin’s travels take him from the high seas to the scorching desert, and it’s done in a technically superb fashion using the motion capture technique that’s enamored Robert Zemeckis for years. While Beowulf could arguably be called the high watermark of Zemeckis’ efforts, the technique here is taken to the next level and results in a very fluid and appealing smorgasbord of eye candy. And it’s one in which the 3D presentation can be considered a genuine bonus. It’s definitely not necessary to see Tintin in 3D in order to enjoy it, but the 3D works much better than the recent spate of 3D fare. 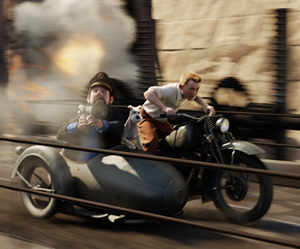 What makes The Adventures of Tintin such a joy are the surprisingly exciting and innovative action set pieces – and there a number of them in this movie. Truly in line with the best of Indiana Jones’ thrills, the action is top notch. For one, the prop plane carrying Tintin (Jamie Bell, Billy Elliot) and Capt. Haddock (Andy Serkis, Gollum in The Lord of the Rings) crashes into the Moroccan desert (after having been fueled by Haddock’s drunken belch of alcohol... but that’s a digression). The propeller blade spins wildly while Tintin slowly slides down the nose of the plane, headed toward an ugly fate. Then there’s a crazy chase sequence involving a motorcycle, a hawk, a hotel borne by a tank, a car full of bad guys, an errant missile, and a dam unleashing its fluid treasure. It’s one terrific cavalcade of action, a set piece of set pieces. It’s the kind of mounting action Spielberg excels at – and he makes it flow so smoothly, so effortlessly. But amid all that, this character named Capt. Haddock is deeply connected to the mystery surrounding the three model ships. A bit of a drunkard (an embellishment to add a little more dimension to the character – and to tack on a pro-sobriety message), the booze bring out his swashbuckling ancestry and he recounts a rousing tale of pirates. His story involves a terrific sword fight set amid a trail of gunpowder, with the bad guy snuffs it out with a foot stomp one second and the good guy reignites it with a swash of the sword the next second; this parry and counter-parry repeats until... Well... Just see it. Great snakes! What a chase! Sealing the splendid action set pieces together is a generous dose of humor. There are some really good sight gags, such as a man getting knocked to the ground and seeing birds circling over his head, chirping, like a Looney Tunes incident. Only in this case it turns out the birds are escapees from the nearby pet store and the shopkeeper runs out to net them back. In another scene, out in the ocean, Tintin swims up to an amphibian plane, his world-renowned hair swirl sticking out of the water like Jaws’ shark fin. But the piece de resistance is a fanciful little subplot involving a bulletproof-glass case (a detail Tintin picks up on immediately from simply seeing a photograph of the third model ship). Much later on, the main heavy, Sakharine (Daniel Craig, Quantum of Solace) is seen escorting an opera singer into the palatial home of the model ship. Aside from that, the movie is loaded with visual details to reward repeat viewings. For some of them, keep an eye on the framed newspaper clippings in Tintin’s apartment for some background on his life of derring-do. Yes. Spielberg was the natural choice to direct this material. It’ll be interesting to see how things fare with the next installment, to be directed by Peter Jackson.